Vinery stallions are poised to make an impact at Rosehill on Saturday with several winning chances headed by All Too Hard gallopers Love Shack Baby and All Too Royal. They are both gunning for hat-tricks at Rosehill and, if successful, will help propel All Too Hard through 100 wins this season. Love Shack Baby (pictured) has won 5 of his 17 starts and another victory will take his earnings towards $200,000. Trainer David Pfieffer bought him for $45,000 at the 2016 Magic Millions National Sale. All Too Royal can send All Too Hard followers home smiling after the lucky-last at Rosehill. 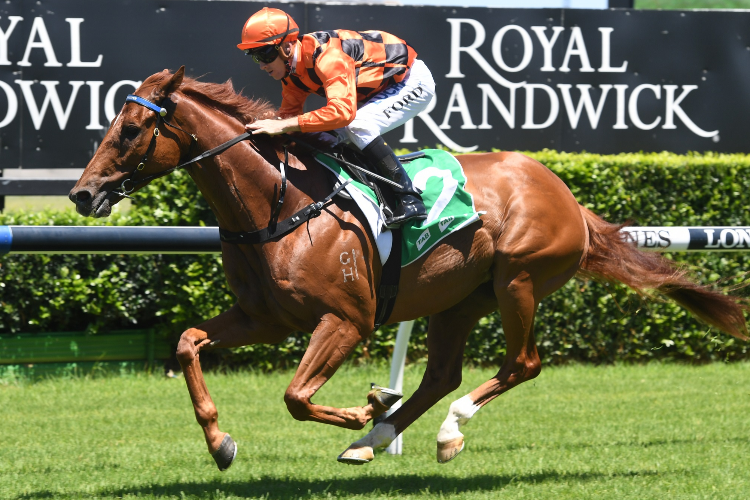 He’s coming off wins at Canterbury and Rosehill and can handle the rise in grade according to trainer Ciaran Maher. All Too Hard has just three crops racing but he’s already embedded in the Australian Top 10 for winners (69) and wins (97) this season. Mossman veteran Dothraki is one of the outsiders in the Expressway Stakes Gr.2 but he can never be dismissed especially after a last-start placing in the Magic Millions Sprint on the Gold Coast. And Moruya-based Mossman gelding Super Star Bob is overdue for trainer Matt Dale – his last win in town was exactly 12 months ago at Randwick. More Than Ready debutante Still Single can play a hand in the Widden Stakes Gr.3 at Rosehill for Chris Waller. She was bred by Vinery partner Steve McCann and was a $500,000 buy for Cambridge Stud owners Brendan and Jo Lindsay at the 2018 Gold Coast Magic Millions. Waller was busy building his juvenile team for next season at Karaka this week and among his buys was a $120,000 colt by Vinery sire Press Statement who Waller trained to Group 1 victories as a 2YO and 3YO. More Than Ready is also represented in black-type events from New Zealand to Perth this Saturday. More Jools has been nominated for the Dunedin Guineas LR at Wingatui and Lockroy faces flying mare Misty Metal in the Scenic Blast Stakes LR at Ascot.